One of my favourite dishes from India is palak paneer. Palak means spinach and paneer is essentially a kind of cottage cheese. It's easy to find paneer in supermarkets these days as Indian food and indeed Ayurvedic food is becoming more and more popular. Especially in the climate of vegetarianism. This recipe is my take on it, it is wonderfully fragrant during cooking causing one's mouth to water for it. Curries are one of the most fun ways of getting a lot of nutrients in one dish and they don't need to be hot - rather the spices give flavour. I used ghee in this recipe but you could also use coconut oil. Both these oils are super in heating as they don't de-nature and you can get the most out of them. Ghee is one of the most wonderful oils for carrying the nutrients from the food to the cells and helping to remove waste products from the cells. It is important that you don't overcook the spinach as there is more cooking later. 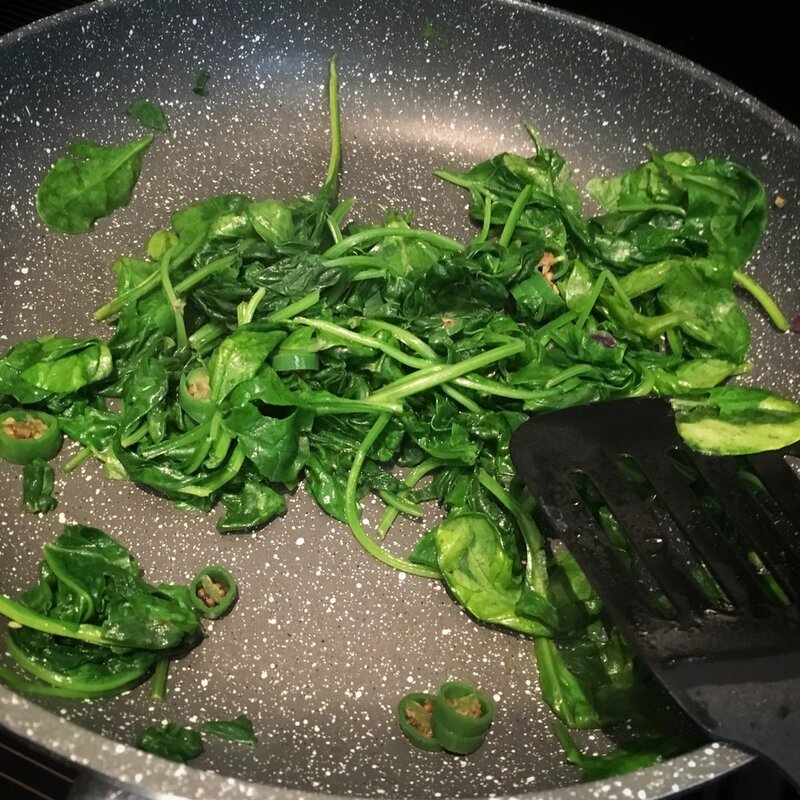 Remove the spinach and chillies from the heat and leave to cool while you continue with frying the panner. Now add the cumin seeds until they begin to splutter. Then add the ginger and garlic and cook for about 30 seconds until you no longer smell the fresh ginger smell. Now add the onions and cook until the onions are slightly browned. At this point, I remove the cinnamon, cloves and cardamom pods so that the masala (spice mix) no longer has bits in it. Add the tomatoes and allow to cook until they are soft. Then add cumin powder, coriander powder and garam masala, salt and cook into a lovely masala paste. You will know when it is ready because the tomatoes will release from the sides of the pan. You can add a little water now and allow the paste to thicken. About 1/2 a up maybe less depending on how thick you want the curry to be. Add the mango powder or lemon juice. I actually used both in this recipe. Lemons are amazing when cooking tomatoes, they keep the flavour but somehow remove the sourness. Blend your spinach and chillies in a food processor and add the spinach to the masala. Turn on a low heat and simmer for about 5 minutes. Now add the paneer that you have set aside. Allow to simmer for a minute or two and serve with coconut flour roties and chopped avo and tomatoes to make this a carb free meal.